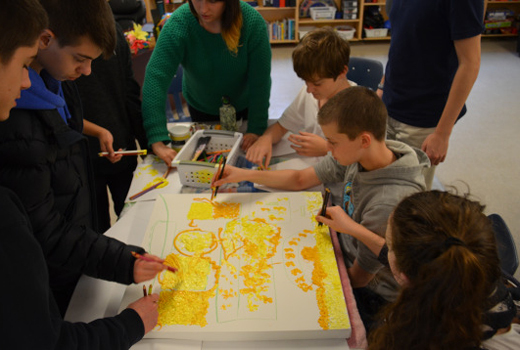 Maplewood Alternative High School in North Vancouver recently took part in a multifaceted residency with artist Marisa Pahl. 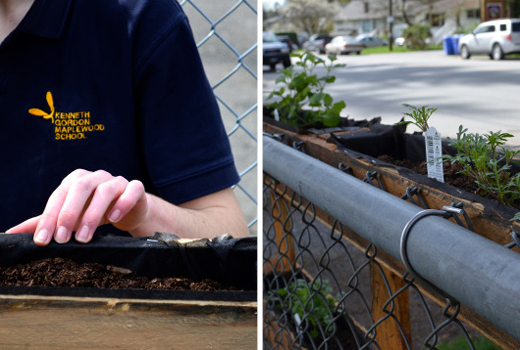 The project, A Global Garden: Place Making, Self-Discovery and Community Building, was supported by a large-scale Artists in the Classroom grant, and took place over the course of the 2014-15 school year. High school students collaborated with Marisa Pahl to design public art projects that explore their individual roles as global citizens. Marisa is a multidisciplinary artist with a focus on social and environmental explorations. 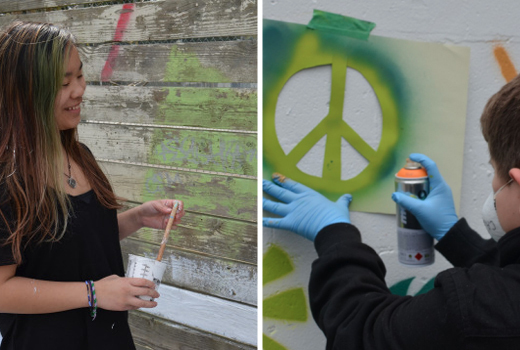 The City of North Vancouver invited the school to adopt and care for a street adjacent to their school, and Maplewood teacher Lauren Dey recognized this as a great opportunity to collaborate with a professional artist in order for the students to fully embrace this learning experience. The Global Garden project allowed students to explore art as a tool for active citizenship through designing and creating site-specific installations. Students completed various self-directed projects, from building a vertical garden out of repurposed pallets to a giant bean bag chair made out of recycled materials. The whole school even came together to plant an urban orchard. At the end of the year, the students hosted an event to demonstrate and celebrate their achievements with each other and the community. Through creative processes, students' projects also touched upon learning objectives in art and social studies, as well as addressing social-emotional learning outcomes such as self-awareness, self-management, social awareness, relationship skills and responsible decision making. You can read more about this project on the blog that Marisa kept during her residency, documenting more student stories. Permanent Arts Integration Based Programming: Marisa was invited to create an arts integration curriculum for the Grade 8 and 9 classes for the 2015-16 school year that builds on what they are learning in Science. The curriculum will be designed in collaboration with classroom teachers, based on what is already for the year. Focusing on using art as a way to learn science concepts — and grounded in projects that explore local food and food systems like water, pollinators, native plants and urban gardening. Hopefully other teachers will be able to use the curriculum and projects, building on them in future years. What's more, the grade 10-12 art elective is following the new BC Industrial Design curriculum. This new course is based directly in the positive outcomes of the artist residency with Marisa. The course focuses on what worked best during the residency for specific students and groups of students, as well as for people experiencing specific individual learning challenges. Future student guided projects will have an outdoor component, engage students in each step of the design process and result in a student made, physical contribution to the school space — functional, aesthetic or both. School Culture: The Sports Day / Get Up and Grow Celebration at the end of the artist residency and 2014-15 school year made teachers and students at the elementary school feel involved in the projects and notice their school space in a new way. High school students led art activities during this event that ranged from painting permanent sidewalk games on the cement, to creating impermanent designs out of flowers and leaves that they left behind for the next group. Many teachers approached Marisa and Lauren in the following weeks to express thanks, ask questions and ask feedback for future art project plans. A conversation was started that people were excited to be engaged in. Outdoor School and Arts Integration: Marie Watler, the guidance counsellor, felt very affected by the year end celebration — as well as the experiences of individual students during the artist residency. She is decisively incorporating art projects and experiences into her planning of outdoor school for every grade — a week long program for the entire school that focuses on unique, nature based experiences. Congratulations to Marisa Pahl and the teachers and students at Maplewood Alternative High School for embarking on this creative adventure. The arts can take you on a journey into uncharted territory, but if you embrace the process, you might just be surprised —and delighted — on where the arts can take you! 1. Teachers and Artists: Apply for Artists in the Classroom grants! The project you just read about was supported by an Artists in the Classroom grant disbursed by ArtStarts in Schools and funded by BC Arts Council and the Province of BC. Artists in the Classroom Grants bring professional artists into your classroom for unique learning experiences. Grants of up to $3,500 for small- to medium-scale projects or up to $10,000 for large-scale projects are available. 2. 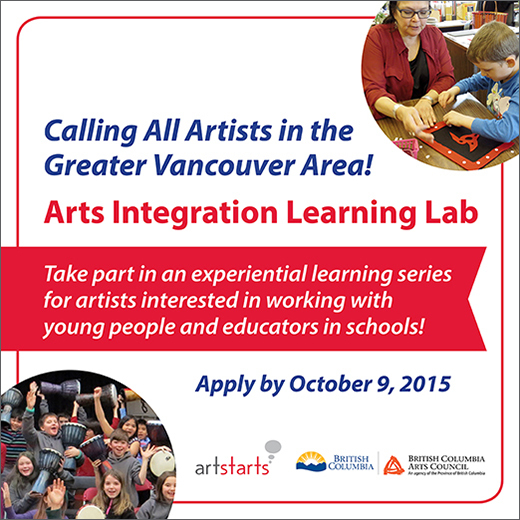 Artists: Take part in the upcoming Arts Integration Learning Lab! Open to residents of the Greater Vancouver area, the Arts Integration Learning Lab is a professional development experience for artists of all disciplines. This program is designed to build the capacity of professional artists and position them to work alongside educators in schools. 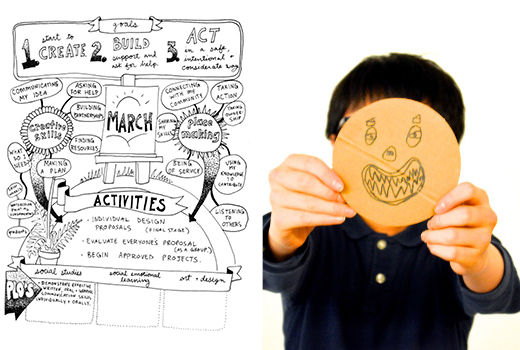 The Arts Integration Learning Lab comprises a series of five practical, experiential learning sessions that will be offered once a month, from November 2015 to March 2016. 3. Teachers: Register for the upcoming Pro-D day at ArtStarts! Making Spaces: Transforming a Classroom Through the Creative Process is an arts integration professional development workshop for teachers, taking place at the ArtStarts Gallery and Resource Centre in Vancouver on the province-wide Pro-D Day on Friday, October 23, 2015. Making Spaces is a full day at the ArtStarts Gallery that will engage your creativity with two hands-on workshops, while exploring arts integration as an approach to teaching: Documenting the Hard-to-Document: Zine Making with Tin Can Studio and Gallery as Classroom, Classroom as Gallery with Elfred Matining.